Mitochondria fulfil multiple tasks in nutrient metabolism, energy production, redox homeostasis and stress response, and are essential for pancreatic beta cell function. The dynamism and health of the mitochondrial network is regulated by fission- and fusion-triggering factors and by a quality control system that removes dysfunctional organelles. Alongside the role of mitochondria in regulating apoptotic cell death mediated primarily via production of reactive oxygen species and release of cytochrome c, there is evidence of other links between mitochondria and inflammation that have implications for cell viability. This review briefly outlines two pathways that are potentially vital for pancreatic beta cell function. The first concerns the regulation of Parkin, a protein that acts, not only as a central player in regulating mitophagy, but also as an activator of the NF-ĸB pathway. The fact that expression of optic atrophy protein 1 (OPA1), a mitochondrial fusion inducer and master mitochondrial cristae biogenetic factor, is increased following NF-ĸB activation highlights a point of mitochondrial control that might be influenced by TNFα signalling. A second axis of interest is suggested by IL-6-mediated upregulation of the fission inducer FIS1 alongside downregulation of mitofusin 2 (MFN2), a guard of mitochondrial fusion and metabolism and an inhibitor of apoptosis. This review summarises a presentation given at the ‘Islet inflammation in type 2 diabetes’ symposium at the 2015 annual meeting of the EASD. It is accompanied two other reviews on topics from this symposium (by Marc Donath, DOI: 10.1007/s00125-016-3873-z, and Jerry Nadler and colleagues, DOI: 10.1007/s00125-016-3890-y) and a commentary by the Session Chair, Piero Marchetti (DOI: 10.1007/s00125-016-3875-x). Mitochondria are crucial cell organelles. They fulfil a varied range of tasks in nutrient metabolism, energy production, redox homeostasis and stress response. Using Newton’s second law, Kaufman et al have described mitochondrial energy output as the product of mitochondrial mass and metabolic rate . 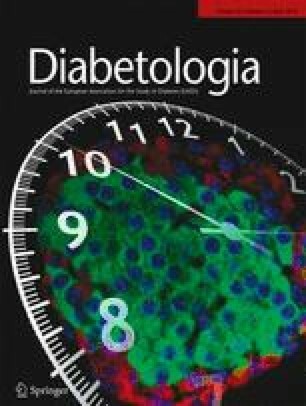 Loss of mitochondrial mass in pancreatic beta cells results in functional impairment and ultimately in the manifestation of type 2 diabetes mellitus [1, 2]. Because mitochondria form a cell type-specific, highly dynamic network, it is important to take into account not only their total mass but also their structure and mobility as health-determining factors [1, 3, 4, 5]. Mitochondrial fission and fusion occur constantly and, along with the removal of damaged mitochondria by mitophagy, these processes maintain organelle vitality and the physiological state of the cell (Fig. 1) [1, 3, 4, 5]. Because mitochondrial function is crucial for pancreatic beta cell stimulus–secretion coupling, mitochondrial network failure is capable of promoting hyperglycaemia [1, 6]. Fission protein 1 (FIS1), which initiates fission, and dynamin-related protein 1 (DRP1), whose recruitment and ring-shaped oligomerisation on a mitochondrion result in its splitting, are two key regulators of the mitochondrial network [7, 8, 9]. The interactions of both proteins are mediated by mitochondrial fission factor (MFF) and the mitochondrial dynamics proteins (MID49/MID51) via a mechanism that is incompletely understood . Viable mitochondria are able to fuse by a process that is conducted by the two mitofusins (MFN1 and MFN2) for the outer mitochondrial membrane and by optic atrophy protein 1 (OPA1) for the inner mitochondrial membrane and its cristae structure [10, 11]. Reintegration of a single mitochondrion into the network is dependent on respiratory chain activity, which determines mitochondrial membrane potential (MMP) [12, 13]. Organelles unable to recover their MMP fall prey to quality control processes and are removed by mitophagy [12, 13]. Mutations in the PARK2 gene are responsible for hereditary Parkinson’s disease, a fact that accounts for the protein being named Parkin [4, 14]. In tandem with its well-known role in dopaminergic neurons in the ubiquitination of damaged proteins, targeting them for proteasomal degradation, the E3 ubiquitin ligase Parkin cooperates with PTEN-induced putative kinase 1 (PINK1) to orchestrate the removal of unhealthy mitochondria [15, 16, 17]. PINK1 is continuously degraded from the surface of mitochondria with high MMP, but as soon as there is a reduction in MMP, PINK1 is stabilised and binds Parkin, eventually leading to mitophagy [15, 16, 17]. Ultimately, however, this specifically initiated pathway becomes fully integrated into the autophagic turnover process, rendering mitophagy dependent on overall cellular quality control mechanisms . Accordingly, pancreatic beta cells from autophagy-related protein 7 (ATG7) mutant mice show mitochondrial swelling . The regulation of autophagy in pancreatic beta cells is currently a topic of lively debate [20, 21, 22, 23, 24, 25]. Autophagy is constitutively active at a low level in nearly all cells and is upregulated in response to stress . Starvation, along with activation of AMP-dependent kinase (AMPK), initiates subsequent inactivation of mammalian target of rapamycin (mTOR), which in turn actuates autophagy . The resulting reallocation of nutrients rescues cell viability . This mechanism is also accepted for pancreatic beta cells, and downregulation of autophagic flux during nutrient abundance has been suggested to contribute to endoplasmic reticulum stress, inflammation and apoptosis, eventually supporting beta cell failure [23, 24]. Conversely, various studies have demonstrated the upregulation of autophagy in pancreatic beta cells in response to hyperglycaemia, diabetes mellitus and obesity [20, 22, 25, 26]. Goginashvili et al recently reported that starvation induces lysosomal degradation of nascent secretory insulin granules in pancreatic beta cells . The resultant available nutrients, mainly amino acids, activate mTOR sufficiently to inhibit autophagy . The authors concluded that there is a positive correlation between autophagy and nutrient-induced insulin secretion . These new findings raise the question as to whether active pancreatic beta cells secreting insulin are more susceptible to mitophagy as a result of upregulation of autophagic flux. It can be speculated that this is plausible, because only mitochondria with high MMP remain in the network, thereby guaranteeing perfect stimulus–secretion coupling. However, assuming that this has a major influence on mitochondrial quality control, a continuous high glucose supply would provoke a dramatic loss of mitochondrial mass, which is at odds with the finding that mitochondrial fragmentation—but not mitochondrial loss—occurs in response to nutrient excess . Recent observations suggest that there is tight cellular control of Parkin in pancreatic beta cells. Genome-wide studies have identified C-type lectin domain family 16, member A (CLEC16A), not only as a gene locus associated with multiple sclerosis and adrenal dysfunction, but also with type 1 diabetes mellitus . Soleimanpour et al reported that C-type lectin domain family 16, member A (CLEC16A) is a membrane-associated endosomal protein and regulator of mitophagy . They demonstrated that CLEC16A deficiency impairs glucose tolerance by reducing beta cell function . CLEC16A functions as an activator of the E3 ubiquitin ligase known as neuregulin receptor degradation protein (NRDP1), which regulates the proteasomal degradation of Parkin. Accordingly, loss of CLEC16A results in increased Parkin expression [1, 29]. Parkin regulation seems to be a prerequisite for maintaining beta cell function. Both the overexpression and downregulation of Parkin result in significantly diminished glucose-induced insulin secretion [30, 31]. Parkin gene expression shows a glucose-dependent pattern. In both primary mouse islets and insulin-secreting MIN6 cells, Parkin gene expression is lower after incubation at high glucose compared with low glucose, suggesting that different mechanisms operate to keep Parkin in check . This aspect also appears central to the recently identified role of Parkin in activating the NF-ĸB pathway . In response to cellular stress, Parkin interacts with the linear ubiquitin assembly complex (LUBAC) in human neuroblastoma SH-SY5Y cells and mouse embryonic fibroblasts . In this process, linear ubiquitination of NF-ĸB essential modulator (NEMO) is increased, thus inducing NF-ĸB signalling . OPA1, a key regulator of inner mitochondrial membrane integrity and fusion that is associated with prevention of mitochondrial cytochrome c release [5, 10, 34], contains NF-ĸB-responsive promoter elements [33, 35]. Thus, the upregulation of OPA1 might explain the stress-protective and anti-apoptotic functions of Parkin that have to date been difficult to reconcile with its long-known task as an E3 ubiquitin ligase. Another recent study has questioned the involvement of the canonical NF-ĸB pathway and favours the non-classical pathway . However, even that study does not doubt that the NF-ĸB pathway controls mitochondrial dynamics and OPA1 regulation [33, 36]. Further work to elucidate this pathway will clearly be important, because there is increasing evidence for OPA1 as a master mitochondrial cristae biogenetic factor [37, 38, 39]. In a recent study, moderate OPA1 overexpression was able to ameliorate the phenotype of two mouse models with defective mitochondrial bioenergetics . Other research has demonstrated that insulin acts to stimulate the NF-ĸB–OPA1 pathway via mTOR signalling in cardiomyocytes , highlighting the cell type-specific nature of this regulation and the importance of beta cell-specific investigations regarding OPA1 regulation. Whereas cytokine-induced activation of the NF-ĸB pathway and its crosstalk with the unfolded protein response has been well studied in pancreatic beta cells [41, 42, 43, 44], the regulation of mitochondrial health and its responsiveness to TNFα has not—to my knowledge—been addressed in this context. However, this interface might be vital for the balance between pancreatic beta cell survival and induction of mitochondrial outer membrane permeabilisation and cytochrome c release, culminating in apoptotic cell loss. Mitochondrial fragmentation is known to be increased in response to various stressors, rendering individual organelles more susceptible to mitophagy and enabling efficient clearance of the network. To avoid critical loss of mitochondrial mass, the TNFα–NF-ĸB–OPA1 pathway is apparently essential for re-balancing the system by increasing mitochondrial fusion and improving mitochondrial cristae structure and, hence, respiratory chain efficiency [37, 38, 39]. We have shown in the laboratory that the TNFα–NF-ĸB–OPA1 pathway plays a role in regulating mitochondrial integrity in primary mouse islets and insulin-secreting MIN6 cells (S. Baltrusch, unpublished results). In addition, we have detected an increase in TNFα expression alongside an increase in OPA1 following induction of mitochondrial stress. Interestingly, a significant increase in IL-6 was also detected (S. Baltrusch, unpublished results). IL-6 has been shown to be expressed in human islets and—to a somewhat greater extent—in those from patients with type 2 diabetes mellitus . Furthermore, induction of IL-6 expression by palmitate, but not oleate or high glucose, has been demonstrated in human islets . Another study has revealed phosphorylation of the signal transducer and activator of transcription 3 (STAT3) in response to treatment of human islets with IL-6 . STAT3 activation is well-known to be involved in the regulation of autophagy and also affects mitophagy . Direct IL-6-induced effects on mitochondrial remodelling have been demonstrated in C2C12 myotubes , a finding in accordance with our own preliminary results on FIS1 and MFN2 expression in mouse pancreatic islets (S. Baltrusch, unpublished results). IL-6 treatment has been shown to increase FIS1 gene expression, which induces mitochondrial fission. In addition, downregulation of peroxisome proliferator-activated receptor γ co-activator 1-α (PGC1α) diminishes the induction of MFN2, resulting in reduced mitochondrial fusion and metabolism [48, 49, 50, 51]. Thus, it is legitimate to speculate a possible imbalance in mitochondrial dynamics, with higher fission and reduced fusion in response to IL-6. It is also noteworthy that MFN2 has an anti-apoptotic effect in B cell lymphoma 2 (Bcl-2)-dependent stabilisation of Bcl-2 homologous antagonist killer (BAK) and prevents the interaction between MFN1 and BAK . In summary, alongside the known autophagy–inflammation–cell death axis [35, 52, 53], there is increasing evidence of direct interplay between mitochondrial remodelling and health control and inflammatory pathways. The PINK1–Parkin, TNFα–NF-ĸB–OPA1 and IL-6–FIS1/IL-6–PGC1α–MFN2 pathways delineated here still need improvement and revision, but have been shown to be important in recent work. Future studies are necessary to establish (1) whether these pathways are active in pancreatic beta cells in the same way as has been shown for other cell types; (2) whether they play a role in the manifestation of pancreatic beta cell dysfunction and/or loss in type 2 diabetes; and (3) whether inflammatory responsiveness is increased following mitochondrial stress. SB is the sole author of this manuscript.